It’s a fact – local government has already shown that it can respond to the financial challenges it faces, and part of this relates to the number of different ‘Alternative Delivery Models’ that many councils are using to deliver front line services. The UK’s economy continues to struggle and national funding settlements for local government continue to fall. In turn, local government has responded positively to this reduction through implementing improved efficiencies, introducing greater innovation and change, and utilising alternative delivery models to protect key public services. Since 2010, local government authorities have been increasing the variety and number of alternative delivery models they use – which helps to demonstrate just how much vitality and innovation there is in the local government sector. Contracts and partnerships with other public bodies have increased significantly in recent years. Common examples include: shared management teams; joint service provision; joint commissioning of social care with the NHS; community budgets; joint transport and economic regeneration strategies; and more joint ventures with the Government through ‘accountable body’ status. What is clear is that further partnership working and joint arrangements will play a significant role in helping local government move towards achieving financial security. For a number of years now, councils have been contracting with the private sector for the supply of services and goods. More recently, the level of outsourcing has been increasing, particularly in the area of back office services. Some more ambitious councils are even outsourcing a number of front line services such as leisure services and housing maintenance. However, this is not universal and many councils continue to maintain in-house provision in these areas. Equally, the number of councils entering into joint ventures with the private sector is also on the increase, and there are many high profile cases that demonstrate this. For this to work and to be effective there has to be robust governance and contractual arrangements in place. Other partnership examples include the public private partnerships created by the local enterprise partnership (LEPs), which support regeneration across the country. Local government is also likely to become increasingly reliant on its partnerships with the private sector as available public funding reduces. One significant change that has gained credence is the establishment of care partnership trusts. These bodies provide a single point of adult health and social care delivery. There have already been a number of successes from these organisations and they remain an indicator of future delivery models. 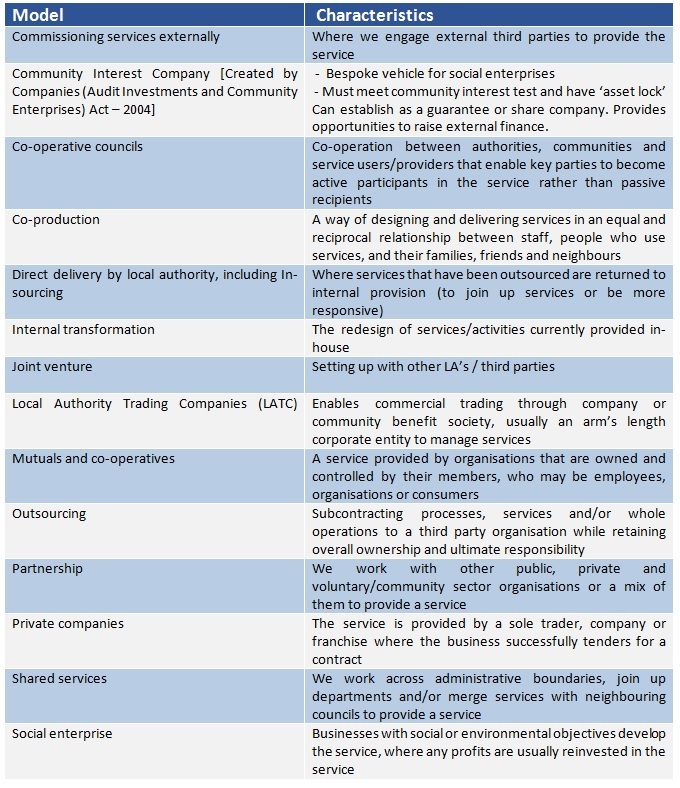 Another significant change over the last two years or so is the creation of new local authority trading companies, social enterprises and trusts. These new entities have arisen for two main reasons. The first is to create trading entities outside of the council – particularly where the services are not considered to be an essential part of service provision or where commercial freedom is needed as is the opportunity to generate revenue. The second is to create trusts for leisure or arts services – that can benefit from setting a different business strategy. These structures are increasingly common, but equally do not come without risk. While accountability continues to rest with the council, service delivery is transferred to the company thus allowing a greater ability to innovate. The options, approaches and alternative delivery models outlined here are not intended to be an exhaustive list, but to provide the reader with an understanding and reasonably comprehensive assessment of this topic. It remains important for local government authorities to continue to innovate, and they need to be fully aware of the risks it they are taking, and whether these are service or financially based. As can be seen, different options and approaches taken by local government to implementing and delivering alternative efficiency solutions, re-modelling existing systems or changing to alternative service delivery models are varied – with each encompassing a variety of benefits, concerns and risks. And as has been seen in the past, not all joint service provisioning arrangements are successful. Similarly, not all local authorities can establish companies with the same ambitions for cross border selling and growth into neighbouring markets. Competing with the private sector opens up a whole new ‘ball game’, let alone the highs and lows of seeking business opportunities in a very competitive and established market. There are other pitfalls – private companies take risks with their shareholders’ capital whilst local councils will be taking their risk with (effectively) the public purse. Numerous examples exist of local government owned companies that have made a loss, resulting in the local tax payer picking up the costs. Where new companies are established, they also need to overcome the hurdles of staff consultations and terms and conditions, and the identification of hidden costs such as contributions to council overheads. As all the above suggests, clear and structured due diligence is essential together with thorough research, assessment and planning before councils should embark on such projects. Any decision that is taken in the way that services are to be delivered, either through a new delivery model or other mechanism MUST be supported with a thorough options appraisal and the, a detailed risk assessment and the submission of a comprehensive and strategic business case.